Is the Open for Business Sign for Iran Now Closed? One of the primary reasons why the Iran lobby was conceived and brought to life was a recognition by the mullahs in Tehran that they lacked all credibility when it came to the Western news media and needed surrogates to help shape the world’s perception of them as more open, accommodating and moderate than they really were. This was especially important in light of the crippling economic sanctions that were bringing the Iranian regime’s economy to its knees, which was part of the discontent that was on display in the aftermath of the scandalous 2009 presidential election. The massive street protests came at the height of the Arab Spring protests toppling governments throughout the Middle East and threatened to take down the mullahs in Tehran. After brutally putting down the protests, the mullahs figured out they needed help to keep their grip on power which led to the election of “moderate” Hassan Rouhani in 2013 and a massive PR push aimed at the Obama administration to craft a nuclear deal that would lift the economic sanctions on Iran. Much has already been written about the launching of Iran lobby advocates such as the National Iranian American Council and its prominent role in pushing for the nuclear deal by working in coordination with the Obama administration in creating the much-discussed “echo chamber” of supporters. The aftermath of the nuclear deal and hasty implementation by the outgoing Obama administration created a narrow window of opportunity for the Iranian regime to get what it needed most at that time: cash and lots of it. The regime was bleeding cash in its support of wars in Syria, Iraq and Yemen so accessing frozen assets, as well as the planeloads of cash paid as part of ransom payments for American hostages, helped stave off imminent collapse. The next aim for the regime and Iran lobby was the lifting of economic sanctions so that business and investment deals could be struck to provide steady future sources of revenue. After an initial rush by some European companies, later followed by Russian and Chinese military sales, the proverbial land rush slowed to a crawl amid uncertainty that the Trump administration and U.S. Congress might reinstitute sanctions because of Iranian regime’s support for terrorism and an alarming increase in ballistic missile launches. It didn’t help the mullahs that their technological partner, North Korea, was busy flinging ballistic missiles into orbit faster than reruns of Real Housewives of Orange County, and alarming most of the nations in the Pacific. The prospect that the U.S. might levy new sanctions slowed investment to a crawl, aside from a few high-profile sales of commercial jetliners, there has been few business deals announced. That drought of new investment once again stirred ordinary Iranians to anger in the most recent presidential election a few months ago which saw mass protests throughout Iran; even including harsh demonstrations aimed at Rouhani himself. The poor condition of the Iranian economy was also a contributing factor to the implosion of the candidacy of Ebrahim Raisi, the handpicked would-be successor by top mullah Ali Khamenei, leading to broad speculation that the mullahs’ grip on power was slipping. 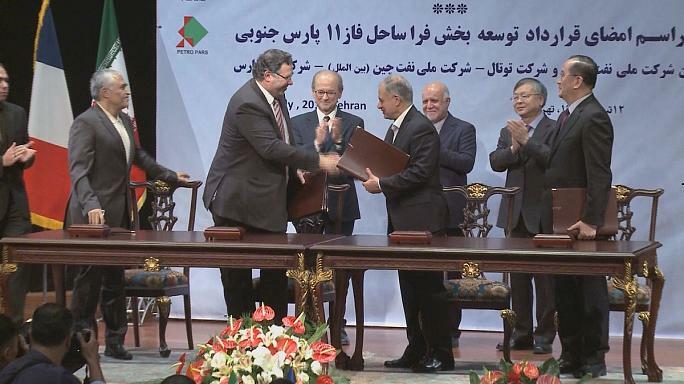 The most recent high-profile deal announced by Iran was with French petroleum giant Total, which agreed to a deal to jointly develop Iran’s massive South Pars gas field. Total was the first, and so far, only major oil player to commit to returning to Iran, while other firms, especially U.S. and British ones remain on the sidelines uncertain of the potential of the re-imposition of economic sanctions. The risks for Total, and for that matter any other foreign company, doing business with Iran are substantial, as outlined in an insightful editorial by Dr. Majid Rafizadeh, president of the International American Council, in Arab News. “U.S. pressure and sanctions on Tehran will likely continue to escalate, affecting American and non-American companies. The US may re-impose its sanctions bill that targets non-American companies doing business with Iran. If a company does business with both countries, its investments could be in peril. Quitting Iran’s market would not be easy for those with long-term investments,” Rafizadeh said. He also alludes to the increasing political instability within Iran, as well as the tightening grip on the Iranian economy by Khamenei and the Revolutionary Guard Corps. That grip exists because of the rising need by the IRGC to funnel even more funds for its foreign adventures which have expanded in various fronts. Also, as Iranian regime ramps up its ballistic missile program, the United Nations may feel compelled to act and sanction Iran lest it has to deal with both an Iran and North Korea crisscrossing the sky with ballistic missiles. Recognizing the threat of possibly having its economy shutdown once again, the mullahs are moving rapidly to take advantage of the Total deal to ready an additional 14 oil and gas exploration for tender offers to foreign companies. Sitting on some of the world’s biggest energy reserves, Iran has already been working on deals to develop fields such as South Pars, South Azadegan, Yadavaran, West Karoun, Mansouri and Abteymour, Reuters reported. France’s Total last week became the first major to sign a post-sanctions development deal with Iran. Russia’s Lukoil and Denmark’s Maersk are also potential investors. “Next on the horizon is the search for new oil, with the National Iranian Oil Company planning to tender 14 oil and gas blocks for exploration in the next two to three months,” NIOC’s deputy director for exploration blocks, Rahim Nematollahi, said in Istanbul. But these deals may become moot should either the U.S. or UN act to impose new sanctions, especially any sanctions once again removing Iran from accessing the international wire transfer network or currency exchanges. All of which places any foreign entity in a precarious position should it decide to invest in Iran. A company also runs the risk being labelled a supporter of terrorism since the vast majority of revenue Iran generates from one of these deals would inevitably be used to fund its proxy wars and support its terrorist allies. This may mean that for the short-term at least, the “open for business” sign for Iran may be just another example of fake news.